Katie Johnson is a teacher of young children, and her passion is to open up for them the world of reading and writing. Red Flags for Elementary Teachers. Children have a lot in their heads already; my job is to help them use their own ideas — and their own passions — to learn to write and read. When they learn “from the inside out” that what they are and do and think is perfectly acceptable, they believe that they are, each one, perfectly valid and acceptable. They believe that they are worth writing and reading about, and they can do it. Each child can say, “I am me. For Katie, the best part is Doing Words with primary children, asking them each day, “What is your word today?” She writes it on a card, the child reads it and traces over the letters, then reads it to two friends. Every day, each child’s own passions and interests are honored and celebrated, with reading, printing, learning the alphabet, and building community all included in their work. How to teach this way is described in detail in Doing Words, Using the Creative Power of Children’s Personal Images to Teach Reading and Writing. As they grow as writers and readers, as they move through the grades, the children write longer stories and writings about what is important to them. All kinds of writing – essays, poems, fantasy, report — can be included in the writing and reading work of children when they have ownership. How to do other kinds of writing with primary and intermediate children is described in More Than Words, Child-Centered Lessons Connecting Life and Literacy. Children who know they are writers can use the works of other writers as templates or models for their own. How teachers can use examples from many favorite texts (such as Charlotte’s Web, Frog and Toad Are Friends, Sarah, Plain and Tall and others) is described in Reading Into Writing, Using Children’s Literature to Teach Writing to Children. 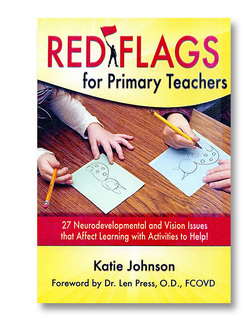 Red Flags for Primary Teachers has received an Honorable Mention award in the 2013 Great Midwest Book Festival contest, announced in November 2013. Contest organizers congratulated all who placed "in a very tough competition." 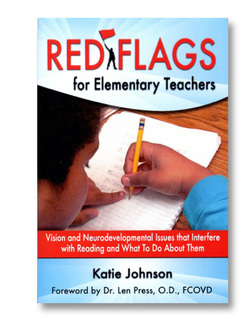 Red Flags for Primary Teachers presents many puzzling children, students Katie has worked with during her teaching career in Maine and in Shoreline, WA. The book is organized into three parts: What I See, What I Do, and What I Have Learned. Each child is presented in a story, a short vignette of classroom life, described in an informal retelling of what the child does that makes Katie concerned about their vision - that is, a red flag. There are about 25-30% of children in primary schools today who have some problem with their vision. "We need to work on this," Katie Johnson says. "It is really a national disgrace." Each child in the book presents a different problem, either a problem of vision or a problem of developmental patterning: tracking; double vision; skipping lines in a book; writing in a triangle down the side of a page. In the "What I Do" section, Katie gives directions for activities that might help resolve or ay least improve this problem. "I hope this contest success will highlight the issues raised in the book," Johnson says. "It is a great pleasure to me."